Zorig show here in this 1991 file photo with a statue of Sukh Bator, founder of modern Mongolia in the background. 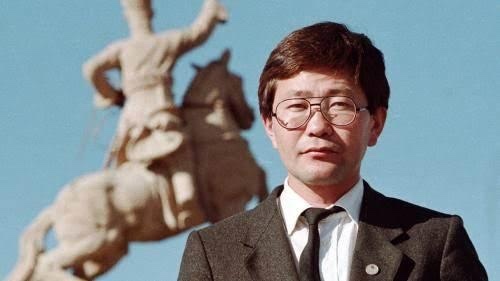 Sanjaasuregiin Zorig, founder of the democracy movement in Mongolia, a minister in the ruling Democratic Coalition and a possible candidate for prime minister, was axed and stabbed to death at his home late October 2, 1998 in the capital Ulan Bator. It is a grisly murder mystery that has cast a shadow over Mongolian politics for almost 20 years. The east Asian nation has finally launched an investigation to identify who ordered the assassination of Sanjaasuren Zorig, a hero of Mongolia’s independence from the Soviet Union who was stabbed to death in 1998, hours after being nominated as prime minister. Mongolian media outlets have alleged that the mastermind’s bodyguard was part of the gang who carried out the killing, before being murdered by one of the men sentenced last week. Amid mounting criticism over why the state has not revealed the names involved, Ulan Bator’s state general prosecutor on Wednesday announced an investigation into who ordered the assassination. Any thoughts? This I went over this case while reading some Mongolian history, and I just had to post it on here, but I'm not convinced and neither are the Mongolian people, about this trial they had for the 2 individuals brought in late last year. Sanjaasürengiin Zorig was pretty big in the 1990s since he led the protests that toppled the former communist system. I also must point out ironically that the Leader of the 1921 revolution & Father of Modern Mongolia, Sukhbaatar; Former Communist leader Marshal Choibalsan, who was in charge during World War II; and Zorig, all influential in Mongolia's history died under mysterious circumstances.